I like to look at my goals, life and career, every quarter. It’s something I encourage my coaching clients to do as well. It’s shocking how the months can fly by without realizing that we have slowly gotten sidetracked and away from that positive, action taking ambition we had at the start of the new year. Did you set some goals for 2019 and if so how are you doing? I shoot for perfection (knowing only Jesus can fill those shoes/sandals) and then I find rest… within the grace that follows my best intentions. This is a great disposition for tackling those big goals. JUST A CRUCIAL PART OF SUCCESS: Looking at your goals with each new season reaffirms your commitment to stay on task and to reach your goals. To fight a good fight and to run a good race. IT HELPS YOU PERSEVERE AND STAY THE COURSE: Re-evaluating gives you an opportunity to assess where you may have gotten off course and where you may need to be calling on God for help. Once we set goals we often have the game plan…and then we focus on that and can get a bit wrapped up in OUR to do list, our success, our progress. Which is our privilege, but if we, no when we, start to fall…it will inevitably feel like a personal crash as well. See, it isn’t so awful that we struggle to achieve our goals, that in fact is quite normal. What is bad is not remembering to have God working for you and with you the whole time. We grow so much as we live through and move past setbacks. Especially as we call on God for help when we are off course. What I hate to see is us giving up before truly asking God to be part of reaching our goals and dreams. God may very well be the one who set your hope/dream/goal into you. And, we know that what seems impossible for man is not for God. So, right now is a great time to reflect on any goals you made for the new year or to decide on some if you didn’t set any, and to get truly God-partnered with those goals for your future. Philippians 3:13-14 I do not consider that I have made it my own. But one thing I do: forgetting what lies behind and straining forward to what lies ahead, I press on toward the goal for the prize of the upward call of God in Christ Jesus. 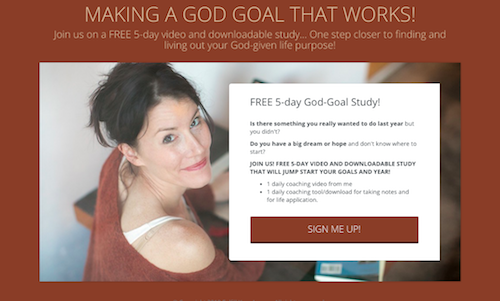 Faith Infused Living Reaches Goals Higher!